Use TB2QA8C to reference this item. Ce géocoin doit voyager de cache en cache et promouvoir la sécurité concernant les motocylistes. Son but est de sensibiliser les gens à être prudents sur les routes et de porter une attention particulière aux motocyclistes.... This coin is to travel from cache to cache and promote security toward motorcyclists. 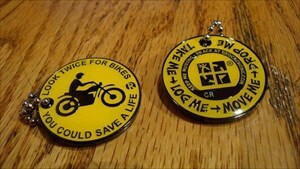 His goal is to incitate people to be more careful on the roads and pay special attention to motorcyclists. Dropped in Near & Dear #3 - Simonds Nature Trail. Took a while, but it has finally been redeployed! wonderful bug house. sending it on its way today.